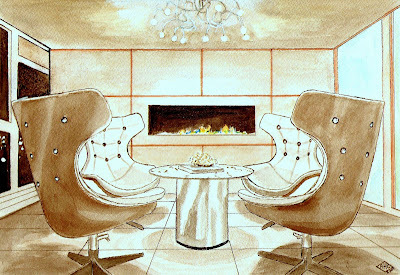 Well here it is....I commissioned Anne Harwell of Annechovie to render a room of mine that was published in Architectural Digest December 2006. She has done a brilliant rendition of this all white room. Thank-you Anne. What a marvelous demonstration of talent - both yours and Anne's. What are you going to do with the piece, and how large is the finished work? Patricia - this is SO wonderful! How happy and proud you must be. Will you show the homeowner? Anne just keeps getting better and better with each new rendering. Where is it going? AND, have fun this weekend with your neighbors. I think this is my favorite peices of Anne's yet! It looks fantastic, I'm so tempted to commission her to do something for me now! Thank YOU, Patricia! It was a pleasure working with you - thank you for the very kind post. This artist is amazing, I love the drawing she did for Courtney at STYLE COURT too. Glad that I found your blog. It's Amazing. I love it and the room. Anne is, theres not a word to discribe how amazing she is. Anne's work is just great, it's beautiful!! What a beautiful room this must have been!